Tags: Antique Print, Balikpapan, Kalimantan, Oil. No. 47. Petroleumbedrijf te Balikpapan. 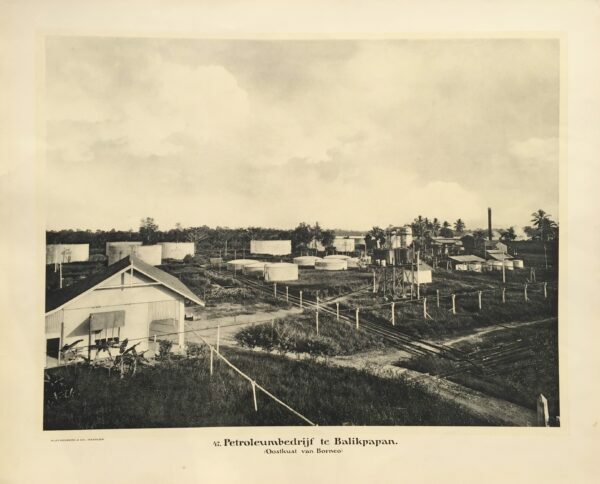 This print depicts an Oil plant in Balikpapan, Kalimantan Timur. Oil was discovered in Indonesia in 1863 but commercial production did not begin until 1889 when 255 tons were produced from wells drilled on the island of Java. Exploration and production quickly expanded to other areas. By 1910, the archipelago was producing nearly 1.5 million tons or more than three per cent of world production. More than half of all Indonesia’s oil that year was produced in Borneo by petroleum companies like the one in the plate below.